How and When is Atlanta Going to Adopt America's Renewed Fascination with Grand Central Rail Stations? As the city formerly known as Terminus and currently known as the “Capital of the South,” Atlanta is interesting in that it lacks a grand central rail station offering local and regional connectivity. For fans of trains and beautiful grandiose rail stations this is also a very disappointing and disconcerting fact. Cities across the country are quietly reinvigorating old stations or building new stations as a means of gaining more efficient regional and local connectivity, redeveloping neighborhoods, and broadening the tax base. Atlanta has the opportunity to follow in these cities’ successful footsteps by realizing a couple of developing plans for a central rail station. Late last week news broke that Madison Square Garden was being kicked out of its current location so that New York could redevelop Penn Station. Though this was a shock for many around the country, as the Garden is associated with so many great sports memories, it was hardly shocking for the city itself: the New York City Council approved the measure by a vote of 47 to 1. Penn Station is the busiest train station in North American and used to be a beautiful and iconic piece of architecture until it was famously destroyed in the early 1960s to build offices and the sports arena. The City Council’s nearly unanimous vote can be seen as a paragon for what is happening around the country: cities are pairing their realization of the important economic and transportation benefits of central rail stations with their deep desire to resurrect the architectural elegance that stations used to represent. As train travel soars in popularity, cities across the country are taking advantage by enhancing current central rail stations or building massive new stations. Since 2000, passenger rail traffic in America has increased 49% to 31 million riders, spurring plans for new rail lines (see my post on the possible Atlanta to Athens link) and new stations. The stations serve not only as centralized facilities for coordinating regional and local rail and bus lines, but as huge economic engines for cities and neighborhoods. Several weeks ago the Urban Land Institute, a think-tank for land use, real estate, and economic issues, issued a report highlighting the growing popularity of stations and their economic impacts. Cities such as St. Paul, Denver, and Wichita are reinvesting in unused stations, while cities such as New York, Washington, Chicago, and Baltimore are planning massive upgrades to already well-used stations. Raleigh is building an entirely new station as it has seen ridership grow 80% between 2008 and 2011 to 200,000 annual riders; this makes Raleigh the second-busiest station in the southeast after Richmond. Many mid-sized cities are in the same situation. While new construction is a response to increased interest, it is also producing massive amounts of economic growth. San Francisco’s new downtown train station is part of a larger project that will soon be home to the tallest building in the city. In Washington, the city is tripling the capacity for Union Station and selling the air rights above its rail yard; this will result in a 3 million square foot mixed-use development that will pay for the entire project. A sign on the plot of land that will be home to St. Paul’s station induced the development of 85 new apartments. Denver’s station is still a few years away from completion, but new apartments and commercial developments are already sprouting up. A new high-tech firm relocated to Raleigh specifically because of the plans for a new station. A future Atlanta station will require tax dollars from local, state, and federal resources, but almost every other city that has invested in this infrastructure has seen large amounts of development that will increase the tax base resulting in a net benefit to the taxpayers and the revitalization of many neighborhoods. 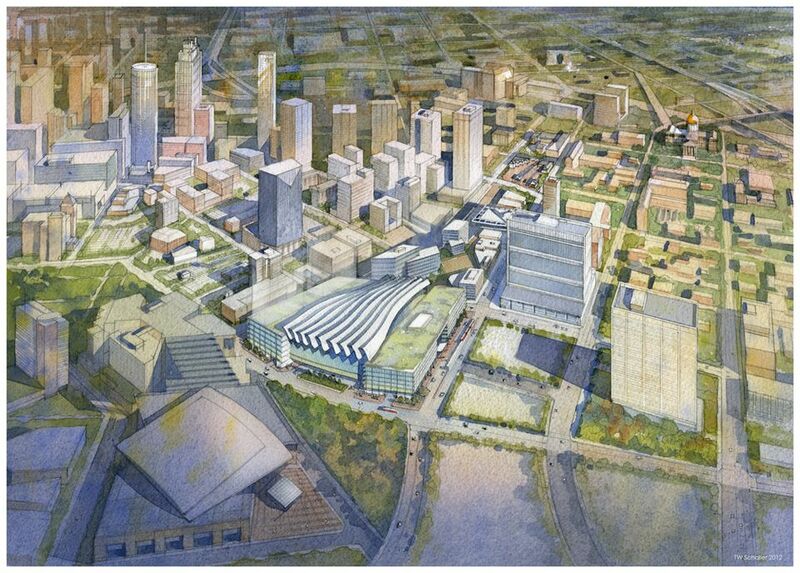 Atlanta currently has two proposals for a new central rail station and both have many positives and negatives. The first option is the one we have heard so much about: the project to the fill the downtown “gulch.” One benefit of this site is that it simply fills a vacant piece of downtown that needs to be used: the rough intersection of MLK Drive, Spring Street and the CNN Center. A second benefit is the site’s close proximity to existing transportation resources. Like airports, it’s essential for rail stations to be connected to an existing local transportation network. The connection dramatically increases the effectiveness of the station as the use of a car becomes much less of a necessity. To make airports more attractive and accessible, both Washington and Los Angeles are spending billions of dollars to connect their subway systems to their airports. In Washington, National Airport, which is connected to Metro, has seen demand soar while Dulles Airport, which will soon be connected to Metro, has seen its demand fall and this partially has to do with convenience; as more people in that city choose to live without a car, demand for an auto-free airport link has increased. While this may not be as applicable in Atlanta due to our auto-dependency, we are planning a station that is going to be here for a while, so we might as well think about the future possibility of more and more residents desiring an auto-free option. This site is in close proximity to existing MARTA stations, so it will be easy (less costly) to extend a MARTA line to the central station or, if no extension is built, easy to walk to an existing station. An incredibly important downside for this site is that it may be much more difficult to actually achieve passenger rail service. CSX recently stated that it would not allocate its line to passenger rail service and since the station is dependent upon this line, negotiating with CSX is likely going to be difficult. Another option would be to just build another line, but this would obviously be quite expensive and officials have stated this is not a desired or likely option. Though CSX may just be bluffing or using good negotiation tactics, the inability to use an existing rail line is clearly a major hurdle. The second potential site for the station is the Atlantic Station option. State land at the corner of 17th Street and Northside Drive could be sold to a developer for a new station that would house both rail and greyhound services. The positives for this site include a potentially cheaper price tag, a quicker process, and the redevelopment along Northside Drive. This option seems to have more political will behind it due to the cheaper cost and lack of rail line acquisition rights (existing Amtrak service runs nearby along the Downtown Connector). The station has the potential to spur development in the area and could create more housing options for Georgia Tech students. This site’s major downside is its lack of connectivity to MARTA. No existing MARTA line runs nearby so an extension would cost hundreds of millions of dollars. Again, because this is a central rail station that should be planned for both now and the long-term future, we need to consider the future importance of MARTA. Though our intercity rail system may not be that great or efficient right now, it could be in the future. Cobb and many other jurisdictions have indicated strong interest in extending rail service and this could dramatically increase funding for MARTA and consequently the quality of service (keep in mind that the failed T-SPLOST referendum would have paid for an extension of MARTA to Cobb County, so this particular concern could have been solved last summer). Both options have their pluses and minuses, but the main goal is to get something built. Central train stations have an enormous impact in terms of transportation coordination and economic and neighborhood revitalization. Our Amtrak station running along the Downtown Connector was never meant to be a central station; it became the default station when the downtown station was demolished in the 1970s. We need to take advantage of the growing demand for rail infrastructure by creating a station that increases the efficiency of local and regional transportation and adequately represents our self as the capital of the southeast. Drunk Pedestrian vs. Reckless Driver, Who Wins? Down with the Flashing Yellow Crosswalk Signals! 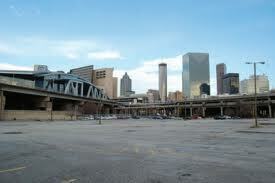 The problem with the Atlanta Station site is that its next to a residential area. I don’t think people are going to want that there. Doesn’t seem like a great place for a major train station. Who are you, sustainatlanta? You leave no contact info.